At one time, Mackey Hall was the camp's central dining facility. It has a kitchen for groups who would like to prepare their own food while at Gilmont, as well as meeting space for 75, along with a fireplace. Named in honor of Mr. L. L. Mackey, one of the founders, his family continues to be involved in Gilmont's leadership. Mackey Hall is a 5 minute walk from the Lodge. The newly renovated Gilmont Dining Hall seats 150 and is known for the fantastic aromas that waft from the kitchen. Guests love the homemade food options and variety of fresh fruits and vegetables. This is the heart of the camp and central to 4 meeting spaces and the lower, middle and upper semi-private lodge rooms. A covered Open Air Pavilion for 100, includes a concrete floor, elevated stage and an attractive brick backdrop. Open to a gentle breeze and forest view, this structure is a perfect place for a speaker, reflection and sharing time. 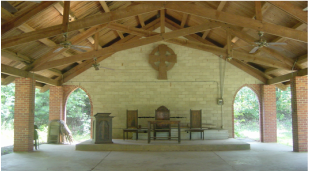 The Open Air Pavilion is a 5 minute walk from the Lodge. 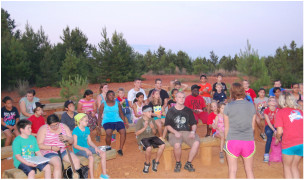 Part of the Barnwell Mountain Range, Gilmont features one the highest hills in East Texas, and the hilltop hike is a camper's favorite. Star gazers enjoy relatively no light pollution, unless of course, there is a full moon. It is a beautiful view anytime, but particularly breathtaking at sunrise and sunset, with seating for 100. The hill top destination is a 15 minute hike from the Lodge to the top, along a rough and rocky trail. Surrounded by the East Texas forest, the peaceful, reflective waters of Lake Kilgore make a beautiful backdrop for this open amphitheater, with seating for 100. The amphitheater is a 15 minute hike from the Lodge.